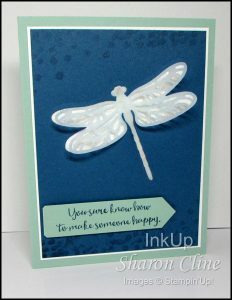 I love the Dragonfly Dreams stamp set and Detailed Dragonfly thinlits – one of the products in the new 2017 Occasions Catalog! I plan on doing more cards with this set. You can use your bone folder to gently roll the dragonfly wings before you glue it in place. 1. Fold the Mint Macaron card base. 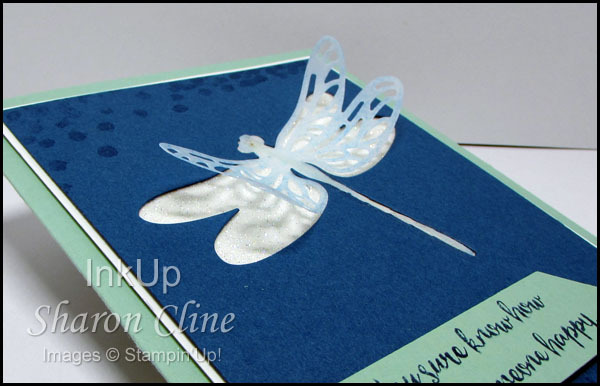 Tape/glue the Whisper White layer to the card base. bottom of the Dapper Denim layer. discard the dragonfly that is cut out. dragonfly. Tape/glue this layer to the White layer. to stick to the Dazzling Diamond layer. use dimensionals to attach to the card front. If you would like to order the supplies for this card, please shop in my online store. The Hostess Code thru the end of February 2017 is TWQSZNKX. 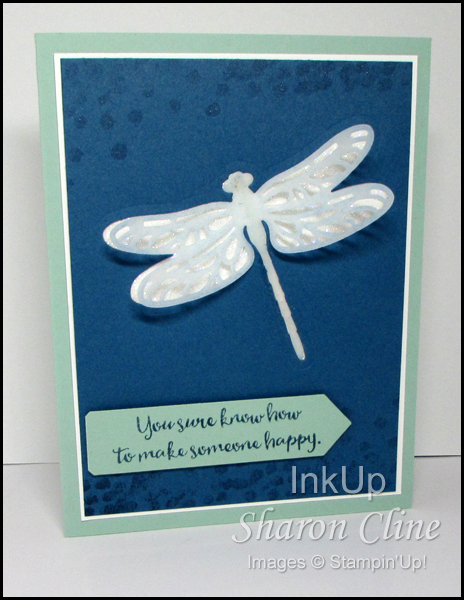 This entry was posted in Cards and tagged Dragonfly, InkUp by Sharon Cline. Bookmark the permalink.